“I promise not to oppress you with too much remorse or too much passion, but since you left us the white rose bush has died of grief.” ~Henry Tilney to Catherine Morland, the final scene of Northanger Abbey 1986 (or was it 1987? It’s a very confusing point for an Austen fan). Catherine herself asked this. See the helpful imagery below to illustrate. There. Do you see how she was thinking it? She DESPERATELY needs to know. And now I repeat, What rose bush? There was no rose bush in the film hitherto Mr. Tilney’s speech, nor is there any mention of one in the book, except a reference on the first page that Catherine enjoyed watering rose bushes. 1. Henry Tilney had a dream where he gave her a white rose bush and it had tragically died after she departed. As much as he wanted to tell her about this dream, he knew it was too inappropriate to tell an unmarried young lady that he had been thinking about her whilst in a bed. Henry planned to tell her AFTER the wedding and was working up to it by making modest allusions to its existence. Unfortunately, he chose an inopportune moment because instead of her heart feeling touched by his love for her, she was rather confused about the dead rose bush. If she had known there was a rose bush that she was to water, she would surely have told the gardener to water it before her departure. 2. Tragically, the 92 minute film was deemed too long so a 4 minute scene about a white rose bush was cut from the final version leaving the audience bewildered. 3. Henry was a romantic sort and was speaking figuratively. 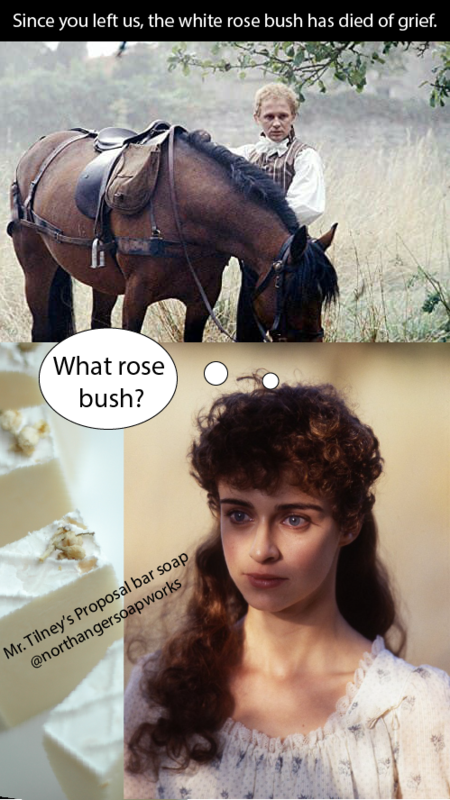 Get your own white rose bush by adding Mr. Tilney’s Proposal bar soap to your cart. 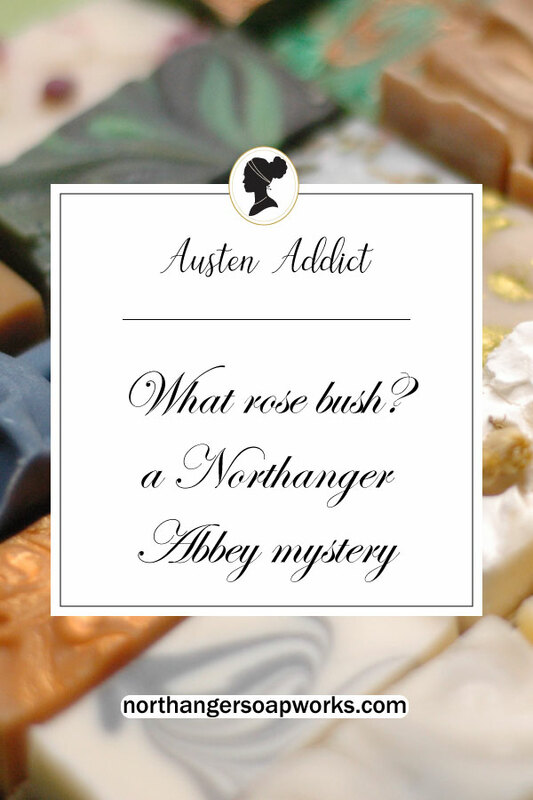 Previous post: Why I love Northanger Abbey 1986 / scorn me if you dare! Next post: Jane Austen Gift Guide: Christmas 2018. Eleven+ things you need!